From the Allergic Living archives. First published in the magazine in 2010. AVOID, AVOID, avoid. That’s how Ann Jeannette Glauber had been treating her 4½-year-old son’s allergies to eggs, milk, peanuts, nuts and shellfish. But at a party a few years ago, Theo grabbed and ate a handful of Goldfish crackers (which contain dairy) before she could stop him. “I kind of freaked out,” she admits, since her son had previously had an anaphylactic reaction to cottage cheese. Theo didn’t react to the crackers, but avoidance remained the family watchword. The boy, however, turns out to be among the 75 per cent of kids allergic to dairy whom researchers now believe can actually tolerate milk – provided it has been extensively heated through baking. The same holds true for egg. While under supervision at Johns Hopkins University School of Medicine in Baltimore, Theo on separate occasions was able to eat one-twelfth of an egg and a quarter cup of milk, both of which were baked into a cake. Emergency treatment was at the ready, but he didn’t react. By May, the boy had started a new diet at home that includes muffins, breads, even croissants; foods thoroughly baked at 350 degrees for at least 30 minutes. There has been a sanctioned bite of lasagna and, in the next phase, Theo will be testing out pizza, which isn’t cooked as long. 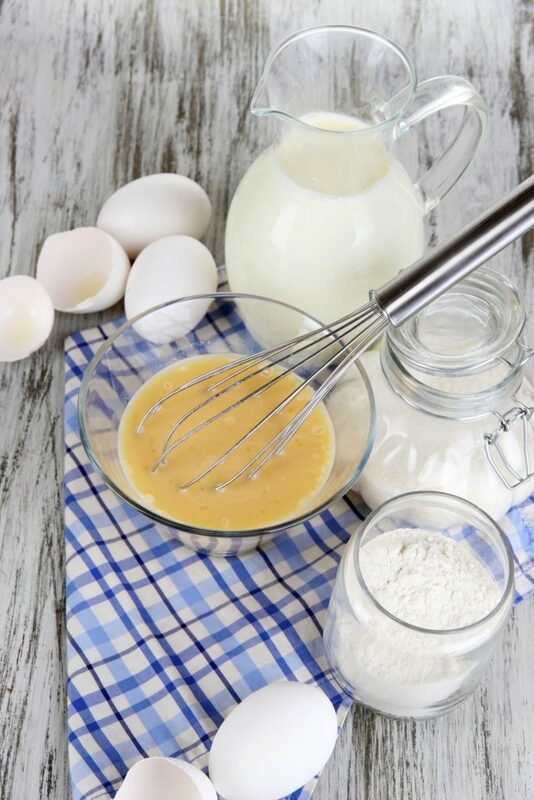 Allergists have long heard stories of allergic children who have accidentally eaten milk or egg – perhaps grandma fed the child an off-limits cupcake, or a daycare provider didn’t realize that cookies contained egg – without reactions. But researchers are getting closer to understanding why kids like Theo can tolerate milk or egg that has been baked, while others still will react immediately. They’re also finding that introducing the baked food into the diet may actually help the child outgrow the allergy. At Johns Hopkins, some dairy-allergic kids, including those who have had significant reactions to milk in the past, have even moved on to unheated foods such as yogurt and chocolate milk. THE CONCEPT of feeding allergic kids baked milk or egg goes against longstanding food allergy management practice and what parents like the Glaubers have been doing to protect their children. That is, they do everything in their power to ensure that not a morsel of the allergenic food crosses their child’s lips. A shift in thinking began a few years ago with a study performed by Sampson and his colleagues at Mount Sinai. They gave each of 100 milk-allergic kids a muffin to eat that contained 1.3 grams of milk protein, in the form of dry milk powder. If a child was able to eat the muffin, baked for 30 minutes, without a reaction, two hours later he or she was served a waffle, which was only cooked for three minutes. Sampson and his team found that 75 of the 100 children tolerated milk that had been extensively heated, and they were told to keep it in their diet. While in the past it had been believed that kids were more likely to outgrow a milk allergy if they successfully avoided it, this study suggested otherwise. In follow-up appointments three months later, those children who had continued to eat baked milk products showed a significantly smaller wheal (hive) on a skin-prick test compared to the beginning of the study. In Baltimore at Johns Hopkins, they’ve taken “the research from the paper to the kid,” says Kim Mudd, a research nurse and the program’s coordinator. Under the direction of allergist Dr. Robert Wood, she and her colleagues are working with close to 200 patients on baked milk or baked egg challenges. The children are coming into the clinic and are eating, under supervision, milk or egg in a muffin or cake that has been baked at 350 degrees Fahrenheit for 30 minutes. The success rate with the baked form has been noteworthy: “Many of these kids outright failed straight-up milk or egg challenges, or have had a milk ingestion that resulted in significant symptoms,” says Mudd. These children are sent home from the clinic and told to keep baked milk (or egg) in their diet. They slowly increase the amount of baked allergen that’s in the foods they eat and, over time, are encouraged to try foods that have been cooked for a shorter time. Pizza is one example, or a food with more milk and that’s been cooked on the stove, such as pancakes. Some kids have eventually been able to tolerate milk that hasn’t been heated. Researchers at Mount Sinai, meanwhile, have been trying to figure out what it is that’s different in the kids who can tolerate baked milk, versus those who can’t. They’ve zeroed in on an answer, and it’s to do with the way the immune system recognizes the amino acids in the protein. When milk is heated, proteins change shape and for some people, this means their immune systems no longer recognize them as an allergen. Having this information is a step in the direction of allowing many more kids to eat baked egg or milk in the diet. As it stands, the baked food must be eaten for the first time in a controlled setting equipped with emergency medication. For Glauber, opening Theo’s diet up to include baked egg and milk has been life-changing. “You don’t have to worry about what’s in baked goods. You get a hot dog, you can eat the bun. You can eat bread or crackers. Theo’s just so excited, because it’s things that he’s always wanted to eat, like croissants,” she said. First published in Allergic Living magazine. Subscribe here to have the magazine delivered to your home. © Copyright AGW Publishing Inc.